I have what seems like a million things on my "to do" list right now. Not only is it Christmastime with shopping to do, gifts to wrap, and things to decorate, but I am also knee deep in glitter from DIY decorations for my daughter's 3rd birthday party this weekend. Seriously, there is glitter everywhere in my house right now. Oh, and I don't have a housekeeper or a cook, so there's that too. So when my 3 month old went down for a nap (not as easy as it sounds, I promise! ), I began to eye my dirty dishes, grimy floor and piles of stuff that somehow just congregate around my house. I actually felt the energy to clean up, which is rare after an interrupted night of sleep for me. And then my two year old said "mommy, will you have a tea party with me?" Clearly, she doesn't see the piles of stuff, the dirty dishes, the pieces of food lying under the kitchen table, so I started to explain to her all of the things that I needed to get done. And then I stopped. 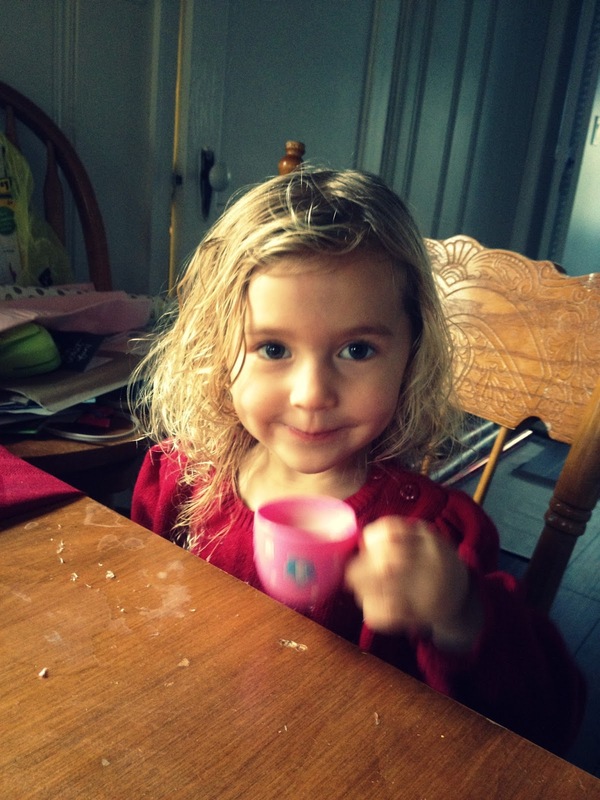 My spunky little two year old with blonde curls and those grey eyes is growing up. She's turning three. Three doesn't seem that old except it was just yesterday she turned two. She can put on her own clothes now, and reach the faucet handles to wash her hands. I realized that there's only so many tea parties we can squeeze into these years. I brewed the tea while she set out the little pink cups. There was nothing photogenic about our tea party. The table had crumbs and spilled milk. Piles of stuff still sat in the background. "Thank you for having a tea party with me mama"
It was as if she knew this was a big deal. She sees me running like a crazy woman trying to get laundry folded, dinner on the table and the baby fed every day. But I think we both knew that this was a moment that mattered. To think I could have missed it. I made a deal with her that she has to have tea parties with me until I die which she of course thought was a great idea. 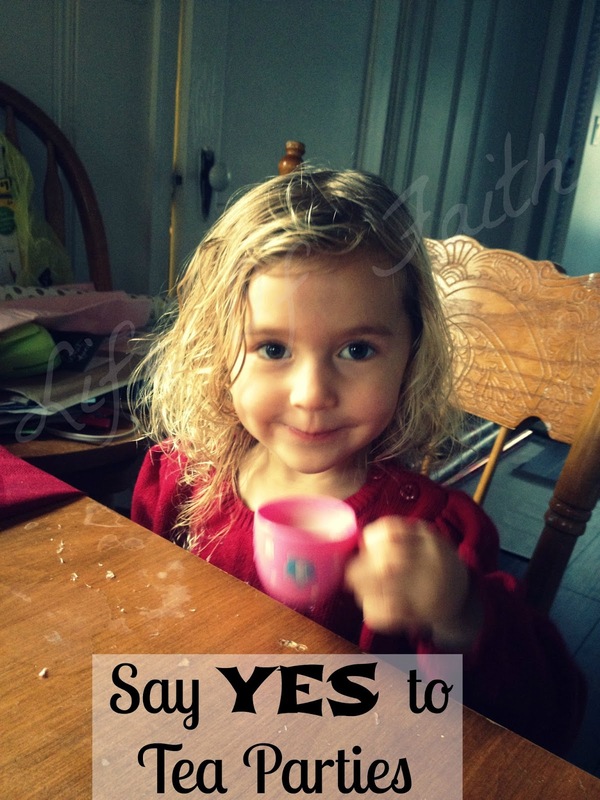 I'm holding her to that, and I plan to say yes to as many tea parties as I can. So sweet! As parents, it is so important to put your children first even when you have a million other things to do. Because in the end they are what matters most. So precious! It's so easy to get caught up in the busyness of running a household and, in the process, brush aside these sweet moments. What a great reminder! Tea parties are the best! 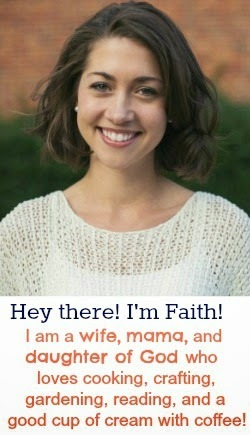 I'm right there with you girl. 3 months with our little guy!